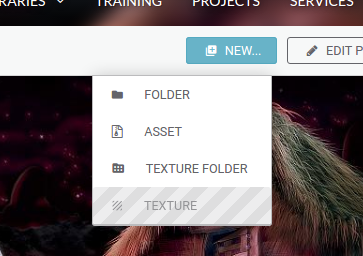 You can now create your own personal texture collection in any of your private projects! That's right! Your own textures uploaded to the Cloud and browse-able within Blender. Watch the video below or scroll for more info. How do I create a texture library? Visit the homepage of any of your personal projects and click on the New... button. 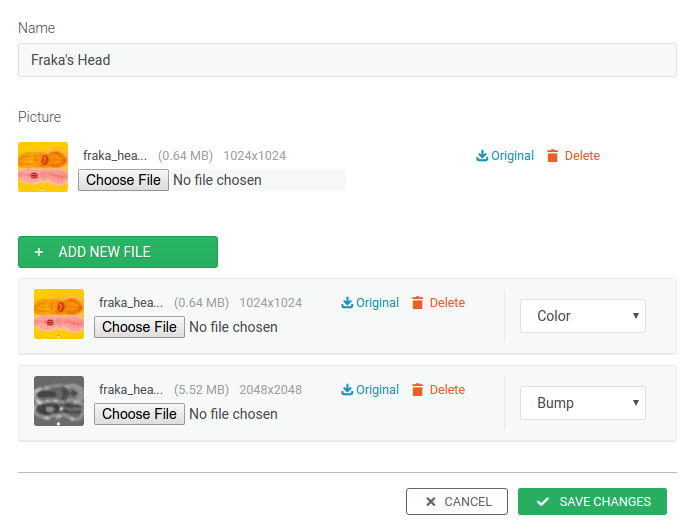 Select the Texture Folder entry. In oder to upload a texture, you should make sure you are inside of a texture folder. Click on the New... button and select Texture. You can now select a preview picture for the texture, as well as upload different map types (Color, Normal, Translucency, etc.). Now the best part: accessing your textures within Blender. For this you will need the Blender Cloud add-ons bundle v1.1. If you already had v1.0, please update it, if you never installed the Blender Cloud add-on before make sure you check out this video. Once the add-on is installed or updated, press Ctrl+Shift+Alt+A and you will see your very own textures, next to the Blender Cloud Texture Library! If you are interested in sharing your textures on the public Blender Cloud Texture library, drop us a line at cloudsupport@blender.org! We currently publish only CC-0 content.